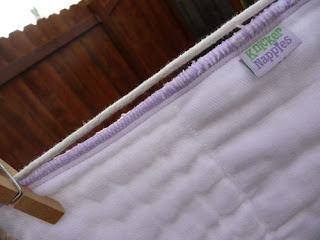 Cloth Diaper Tip : Pinching Pennies? Learn to love the prefold. 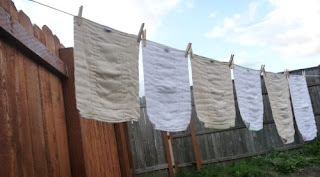 I have to say that when I first started using cloth diapers I was adamant that I would not ever use prefold diapers. Why use them? My mother used them and I am not the same woman she is (although she is quite wonderful). Then I tried using a few and I have to tell you, the prefold diaper is the Royal Flush in your cloth diaper money saving hand. If you do a quick Google search on the folds you can use with a prefold diaper you'll find many fun and fancy ways to fold a prefold diaper. Let me tell you though, it doesn't have to be difficult, in fact it can be quite easy with no Snappis, pins or Boingos required. How you ask? Well, simply fold the prefold into thirds and place it in a cover. 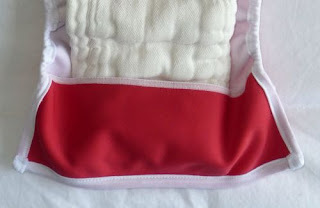 Like a Palm Tree (pictured above) or Wolbybug diaper cover, it has a flap that will hold a prefold into place and unlike microfiber (which should never be directly on baby's skin) is very soft and safe directly next to baby's bottom. Both diaper covers are less than $11 and you can purchase our bleached or unbleached prefolds in sized sets of 1 to 24 for no more than $3.45 at Knickernappies Retailers. You can also use prefolds in your pocket diapers as an insert or acting as a doubler for extra absorbency. So if you're on the fence about cloth diapering or needing to stock up on a few new diapers but you're feeling the financial purse strings from the holiday season really consider the simple prefold diaper. It doesn't have to be fancy to be worth your cloth diaper dollar. 15408I LOVE my prefolds! Even after they outgrow the little ones, they are a perfect size to use to 'stuff' another prefold for an all-night diaper. I had the ability to buy a set of whatever diapers I wanted not long after my youngest was born. I had started off with a set of prefolds and covers because they were all I could afford. Then our tax return came a few months later, and I gleefully turned to "better" options. Guess what? I tried pockets. I tried fitteds. I hate the drying time of aio's. But prefolds? Oh yes, we came full circle. They're soft, they're absorbent, and I can fold those suckers trimmer than any fitted or pocket could dream of. Penny pinching or not, they're a solid investment I recommend to everyone.